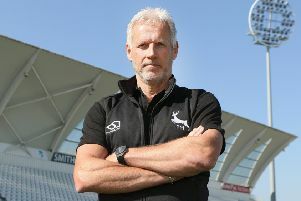 Nottinghamshire fought back on the first afternoon of their LV= County Championship match against Durham at Trent Bridge, before being bowled out for 204. Having been put in by the visitors they had lost six wickets during the morning session and it became 73 for seven immediately upon the resumption, as Graham Onions trapped Brett Hutton lbw for one. Thoughts of polishing off the rest of the innings were quickly put on hold as Steven Mullaney and Luke Wood set about the rebuilding mission with a stand of 92. Mullaney had a life on 41 when he was put down in the deep by Barry McCarthy but the young Irishman, making his first class debut, eventually gained his revenge when he trapped Mullaney lbw for 63. Wood continued to go for his shots, passing 50 for the third time this season on his way to an undefeated 65 but he was left high and dry as the last two wickets fell in quick succession. Shortly after the home side had brought up an unexpected batting point the innings was closed out by Onions, who bowled both Jake Ball and Harry Gurney in the same over, to finish with five for 56.